Make an Advent calendar from recycled cardboard tubes and wrapping paper. It is an Easy Christmas craft for kids. Enjoy! 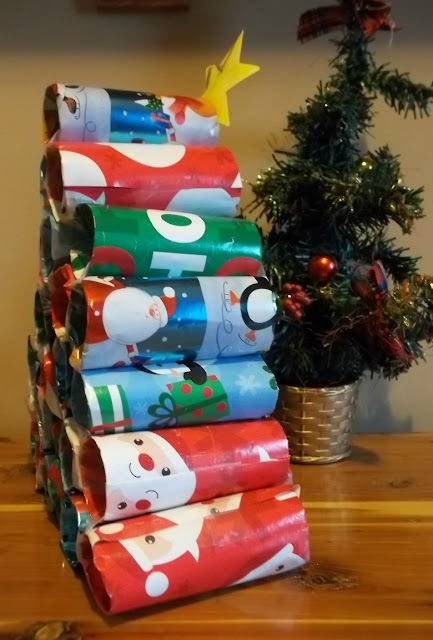 Easy Preschool Advent Calendar from cardboard tubes. So, we save our toilet tubes. Yes, I am one of those people (I save my jars too) here is a post from one who is not, it made me LOL. Just imagine the possibilities? Toilet Tubes are even better. They just cry out for re-purposation. Do you like that word? I just invented it. There, now I copyrighted it too. 12/2012. Maybe, I can trademark it? "You're fired!" Wait, what was I saying? Toilet Tubes and Cardboard Tubes = Awesome craftability. So... we save our toilet roll tubes. Except we moved, and then we didn't, so I had to start all over. I barely had enough for 25 days, and they were all different diameters and lengths. We had fun, but it wasn't perfect. Remember, it's the fun that counts. To make our Advent Calendar tree, we took an idea from something similar we saw on Pinterest and it sparked an idea. You know, how that goes. Hmmmmm, very pinteresting. I wonder how I can recreate it to make it my own? 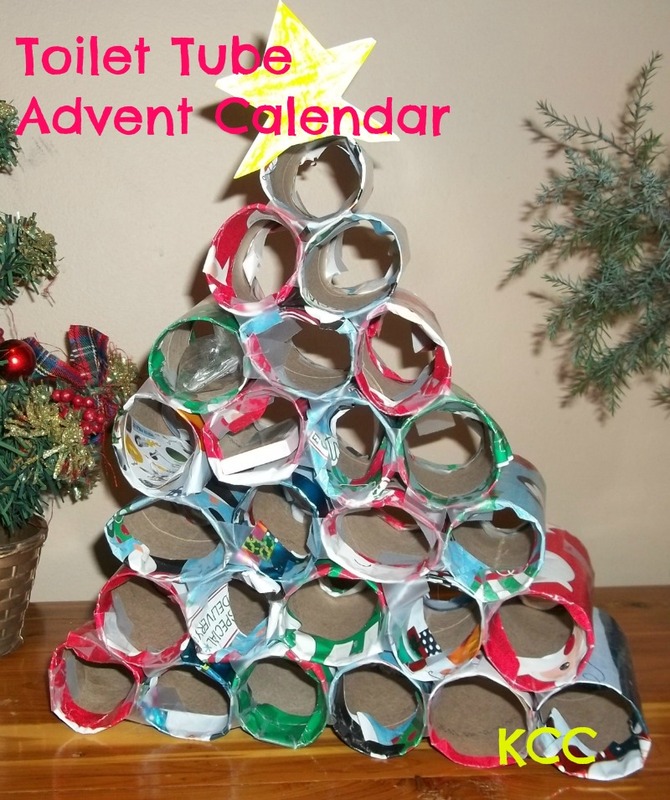 Cardboard tube Advent Calendar Tree. Ow, my brain just exploded a little! I'm going to get my crafty blogging buddies together and make a contest. I'll call it, "The American Crafter" and we'll find something pinteresting and give everyone an assignment to make it their own and you can vote but not by phone- maybe just by comments. Copyright, Trademark, and Hashtag that please. To turn aside especially from the main subject of attention or course of argument. I do that a lot when I write on Sundays. It's my little form of meditation. So who's in? Are you up for a Voice/American Idol style Crafter contest? You will need 25 Toilet Roll Tubes minus the toilet paper, but I guess you could use the toilet rolls, now wouldn't that be pinteresting? 1. Cut little squares of wrapping paper and roll onto your tubes. Attach with tape. 2. Decide how many will be in each row to taper to one on top. 3. Attach the bottom row together with a little piece of tape inside the end of two tubes. 4. Stack the next row. Repeat step 3. Choose to glue first row to second row or use tape. 6. Cut out a Star or Angel from Construction Paper and glue to top of Christmas Tree. 7. Fill each slot with little gifts or fun notes until Christmas Day.